July | 2013 | From Here to Haiti, Ltd.
were uneven, had no ramp and invited accidents. The children had to be extremely careful not to take a fall. They had no toilet but this was being remedied by FHTH. The cistern in the yard was filled with rain water but it had no cover, a danger to the children, and inside mosquito larvae swam undisturbed. Pere Charlince Vendredy, the pastor, smiled at my remarks. He said that he was grateful to have the little that was because just a stone’s throw away, at another school, the children had even less. It was hard to believe, but he took me on a short walk. Just about 500 feet up the road was a school in session. I approached the first classroom, an outdoor construction with four posts, no walls and tin roofing. 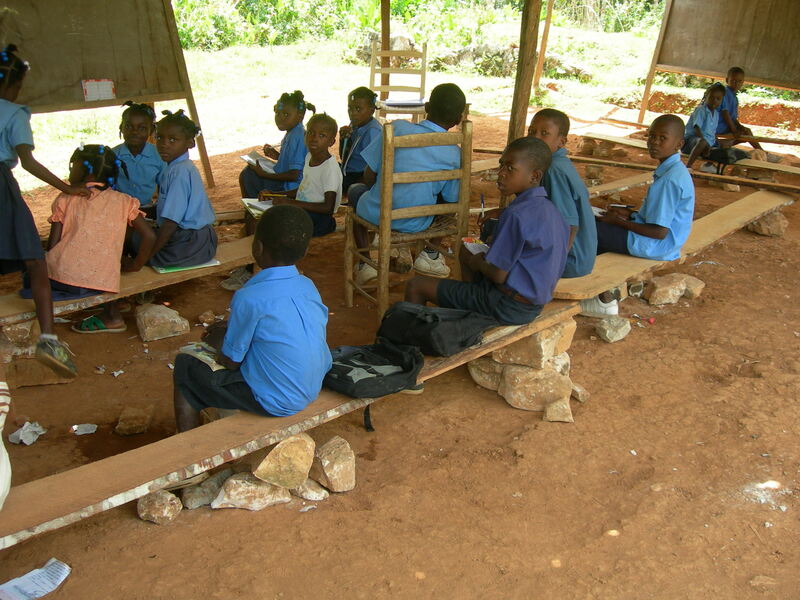 The teacher had no desk and the attentive children sat with eyes fixed on the teacher as not to miss a word. Their bench brought tears to my eyes: a few rocks on which rested a wood plank. The teacher approached and welcomed me to the class. I voiced my sadness at the seating. He said that seating was secondary to learning and that the students were happy just to be in class even without a proper classroom or bench. He took me to an edifice where other classes were being held. They had separate classrooms, desks and benches, but the roof was leaking and the floor was just large rocks strewn about. The image of these children remains with me each day. I cannot help thinking of how much we sometimes take for granted. We open the faucet and expect potable water to flow; we turn on the switch and expect the light to come on; we attend school and expect to sit on proper benches and walk on an even flooring. However, to acknowledge how easy we have it can only help us strive to help those who are less fortunate. 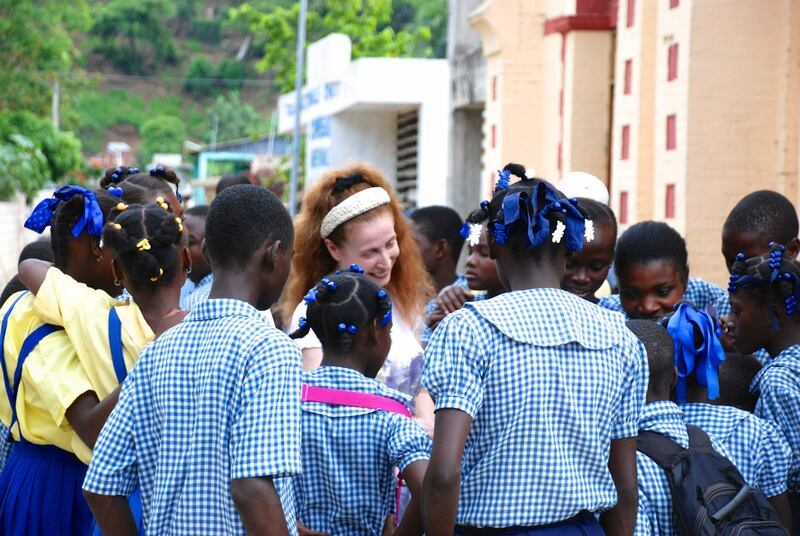 I can’t believe how quickly “From Here to Haiti” has grown! Pat asked me to go, sort of out of the blue, after a choir rehearsal in the Summer of 2010. Without much thought I said, “Sure, why not?” I had some vacation days to take and where else would I go but a country torn apart by politics and covered in rubble, only six months after the devastating earthquake?! 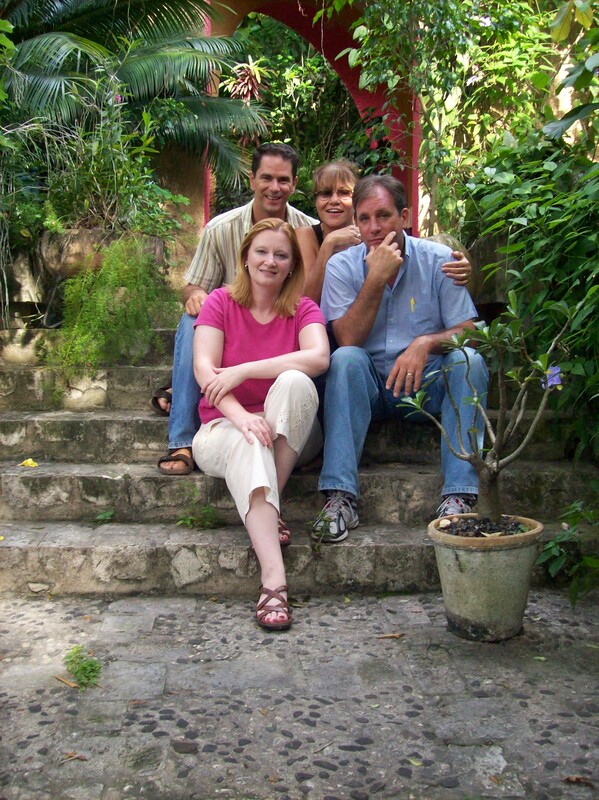 I still don’t know what made me say “Yes.” We were not yet a formed organization with a purpose, by-laws and mission statement, just four people who wanted to see if and how we could help. Putting together a formal event for a benefit is no small task. First the venue has to be selected, the minimum number of guests decided upon and a deposit check written; then comes the task of advertising, selling tickets, printing a journal, and planning a program that will keep guests entertained for five hours all the while focusing on raising funds. What a unique company. Browsing through their website was an experience in itself. One “experience” was more amazing than the other, so much so that it was difficult to navigate way from the site. Their “Airborne” experiences let you participate in an air combat dog fight, ride in a glider, helicopter or a hot air balloon; you can hang glide, sky dive, or just take a scenic plane ride. 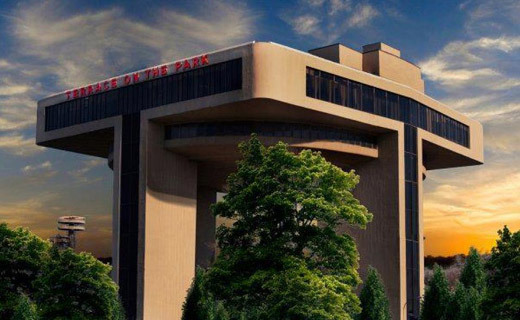 Their “Drive” experiences let you ride a stock car at the Pocono International Raceway, give you the thrill of a dune buggy, ATV, dirt bike, or enjoy a dragster fantasy ride. Their “Tour & Activities” section is full of great excursions and programs: fishing, golf, sailing and whitewater rafting; art, dance, pottery, glass blowing classes; beer making, wine and cheese tasting, not to mention inspiring city tours. By the time I looked at the “Food & Wine” section I realized that I had spent a whole day browsing and that being methodical in my search would be more efficient. I selected “New York Gifts” from their wide choice of cities. The NY Experiences are too numerous to list; tours included Ground Zero, Movie locations, Broadway, Ghost hunting and Chinatown; trapeze class, art class, wine tasting tours, spas, sailing, photography, martial arts, cooking, perfume making… and the list goes on. 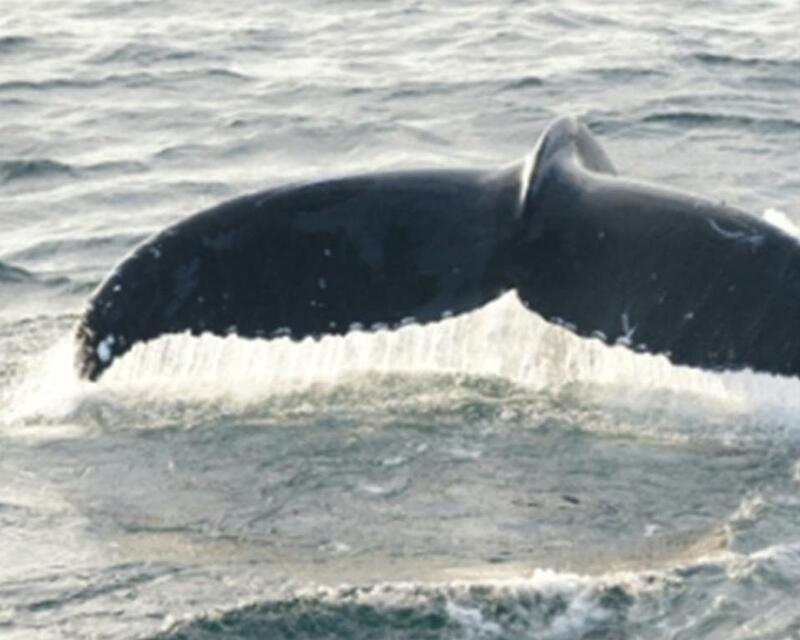 We selected the New York Harbor Whale and Dolphin Watching Cruise. The winner of this amazing prize will head out with a guest aboard the American Princess for a four-hour Whale Watching adventure at Riis Landing in Rockaway, Queens. With the views of the New York Harbor and Manhattan skyline in the background, cameras will snap pictures of Bottlenose Dolphins and Whales swimming and leaping out of the water. You can be sure I will bet on this prize. 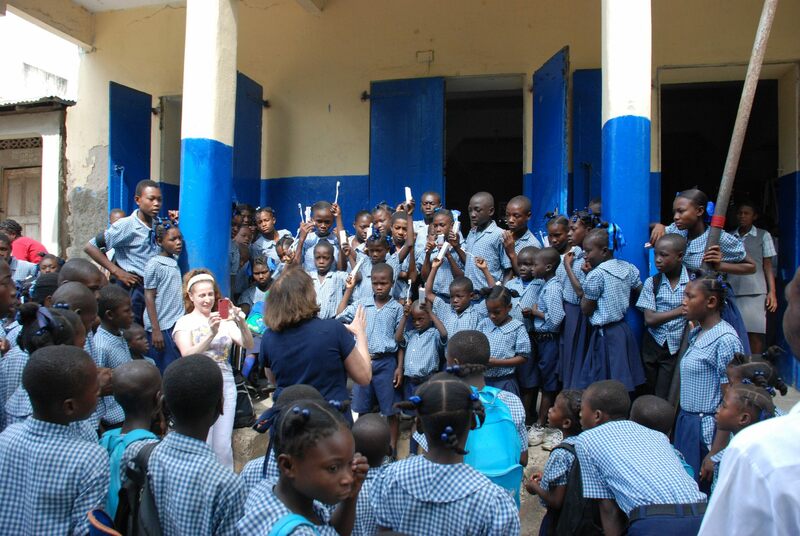 From Here to Haiti would like to thank Ms. Evie Stacey and Experience Days for their generous donation. Be sure to visit their site at http://www.xperiencedays.com/ to see the exciting choices. 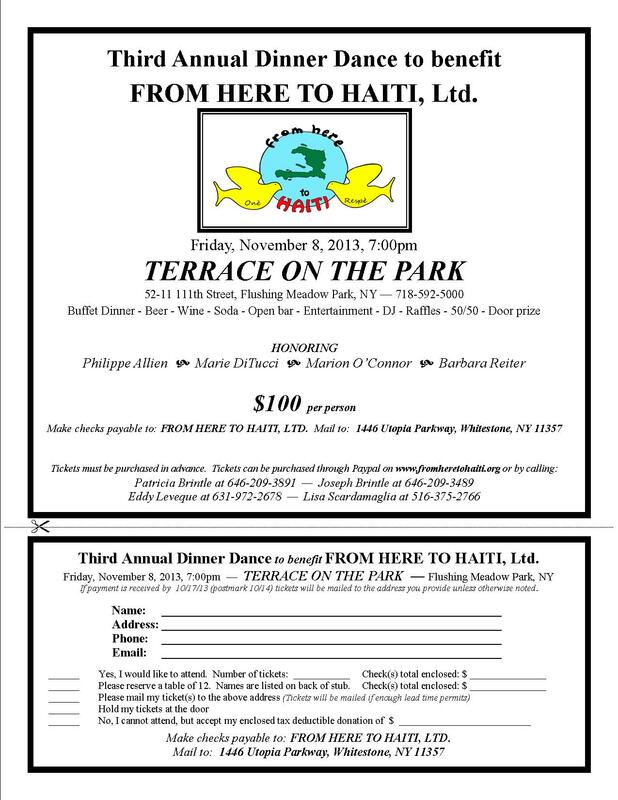 The From Here to Haiti Dinner Dance Fundraiser is on November 8. Mark your calendars, make your reservations and get your tickets from our site. Tickets will go fast. School was in session as my friend Chantal Westby and I approached the classroom. We were mindful not to disturb the children and tried to catch the attention of the teacher. Although all the children were very aware of our presence, the teacher however, tried very hard to ignore us. We insisted and he reluctantly came to the door. We apologized for disturbing the class and asked if it would be OK to distribute gifts to the children. We explained that we did not mind waiting for the end of school but did not want to miss them at quitting time. He called the school master over who told us to return at the 11:30 a.m. lunch recess. We were punctual yet the children were already on the school veranda eagerly waiting to see what we had brought. I asked how many of them had toothpaste and a toothbrush at home and very few raised their hands. When asked how they cleaned their teeth they chuckled and one child in the back said they washed with water and used their fingers; others said they sometimes used the cob after eating an ear of corn. 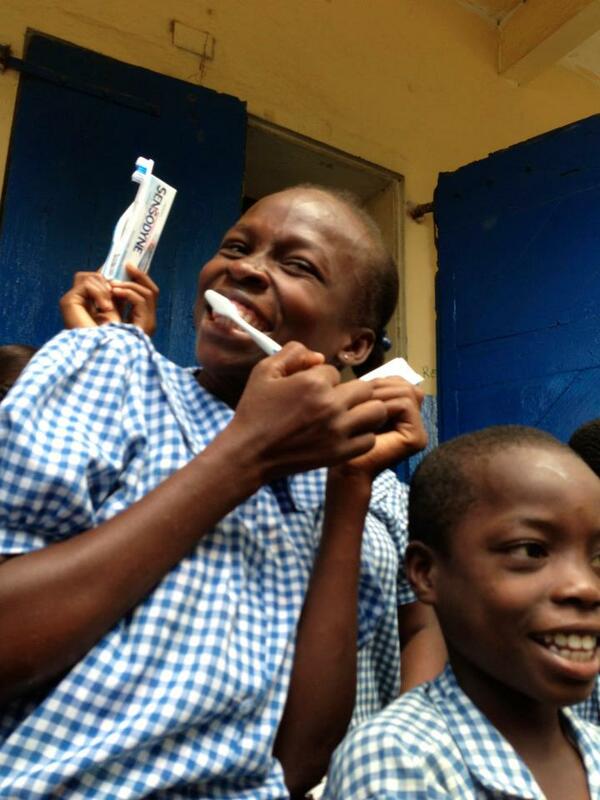 We told them a dentist in New York called Doctor Paul Penzi had sent a gift of toothpaste and brushes and we proceeded to distribute the loot. They were overjoyed and so very grateful; we even had to hold them back as not to get trampled. I asked them if they had any good word for the doctor and as if rehearsed in one voice they yelled “mesi docte Penzi.” (Thank you doctor Penzi.) We snapped a few pictures and as I watched the children walk to the plaza I realized how very much we take for granted. A group of girls ran back to us and said: “di docte penzi nap laprye pou li” (tell Dr. Penzi that we will pray him) to which I said that the message will be gladly delivered. 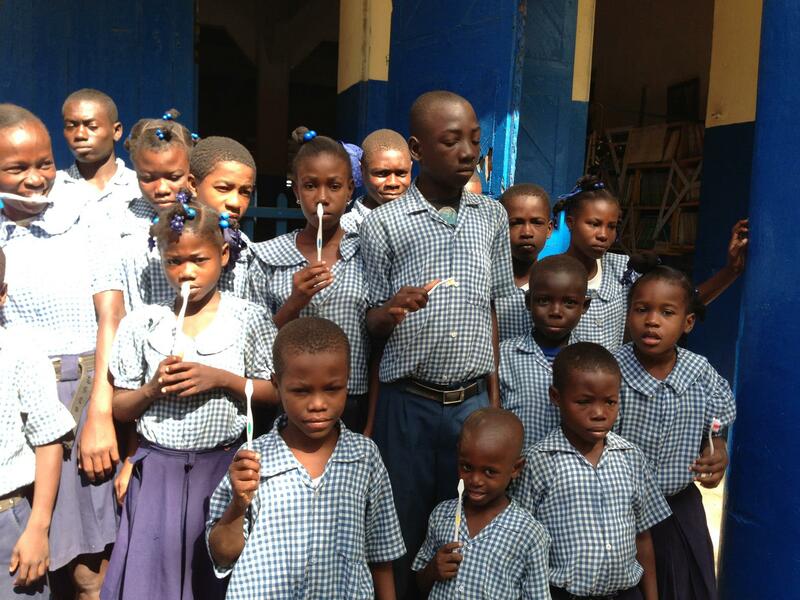 When I think about From Here To Haiti, I think about its members, and the passion they have towards helping people. Sure non-profits raise money to get something done. Sounds simple, right? NO. It’s not at all that simple! The members of From Here To Haiti are not only executives running a non-profit organization, they are also the administrators, schedulers, fundraisers and foot workers going from door to door; collectors and shippers of items in need; repairers, painters and sculptors of broken statues for Haitian Churches. Their “to-do” list is never-ending, and that is all before they plan their trip, meet up with other volunteers in Haiti, lay out the plans, and then start the physical part of the job! It’s exhausting; but to them, it’s exhilarating! From the moment a job is decided upon, From Here to Haiti members start to sweat. Their sweat increases their passion, and like their “to-do” list, their passion does not cease. Hundreds of organizations are researched for grants; hundreds of calls, texts, emails, postal mailings are made to raise more funds or for donations of laptops, statues, clothing, and whatever else is needed to help people. Every donation, whether it be $1 or $100 is appreciated with gratitude. And, don’t forget, there are many, many obstructions that need attention in order for them to progress. When a job is completed, you see on their website exactly what was done. This is the simple part: another job completed because of love. I do not know much about non-profit groups helping Haiti rebuild except for what I read in the media. Sometimes the news is positive; sometimes it’s negative. 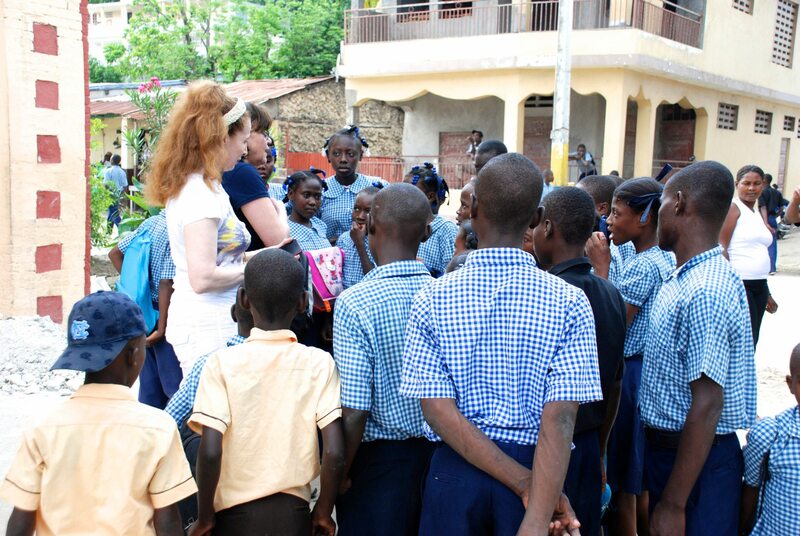 From Here To Haiti is very different to me because I know two of the members personally. I see with my own eyes and feel inside my heart the passion that my friends have towards rebuilding and improving living conditions in a place very close to their hearts. I get to see what their process involves in raising whatever money and materials they can so that they can help rebuild even a small portion of what Mother Nature’s destroyed in communities. The hope and faith of the people affected by this destruction are no doubt reinforced as From Here To Haiti lands on their soil. 1 – Be selective. When deciding to give to charity, your first responsibility will be to select a charity. Go with your heart and select a charity that specializes in what touches you the most. It may be the welfare of children, women safety, helping third-world countries, cancer research, or saving the environment. Whatever your choice, your gift to that charity will be that much more rewarding if their work focuses on a subject matter that you care about. 2 – Get to know your charity. Once you’ve decided what type of charity you want to give your money to, you will then need to select one among the field. Whether you select a large charity like The American Red Cross, or a small one like From Here to Haiti, Ltd. it is important that you do your due diligence in selecting the charity. The internet is a good place to start and there are many sites that will navigate you to one that will respond to your heart. Seek the advice of friends and acquaintances and learn from their experience. Once you’re zeroed in on a charity, check their website; speak with their officers, ask to speak with some of their donors. Learn about the work they are doing and become familiar with the charity’s methodology. Find out where they are located and if you can visit their office. Also, tax form #990, which will tell you about the charity’s financials are usually available for review on the internet. The more you know about your charity, the better you will feel about giving. 3 – Know where your money goes. Find out specifically where your money goes and what percentage of your donation will actually reach the beneficiary or be used for the intended cause. You may want to select a charity that raises money for a specific project and you may even want to follow the project’s progress; also, find out about the impact that your donation will have. Select a charity with a proven track record of success in accomplishing its projects. 4 – Volunteer with your charity. If this is your inclination, ask if you can volunteer to participate in one of your charity’s projects. Many charities depend on volunteers to get their job accomplished and your help can be a very rewarding experience. Also, remember that charities depend on donors to accomplish their mission. Ask for accountability but do not let your inquiries suppress your generosity. 5 – What are your tax benefits? Not-for-profit companies must be registered with the IRS in order for your gift to be tax deductible. Be sure to obtain an acknowledgement of your donation for tax purposes. You tax preparer will be your best help on the subject.